Mohammad Kaif once again played saviour as he pulled Indians out of trouble with a fine innings of 77 against West Indies ‘A’ on the final day of the three-day match here today. Injuries to some of the key players including star batsman Marcus Trescothick and fast bowler Andrew Caddick has delayed the announcement of England’s team for the first cricket Test against India starting on July 25. Yuvraj Singh, one of the chief architects of India’s sensational victory against England at Lord’s, said he was disappointed to miss the forthcoming four-match Test series against England through injury. Legendary Test batsman Gundappa Viswanath today said the Indian team that won the trination NatWest Trophy was a “World Cup winning combination” but favoured inclusion of speedster Javagal Srinath, saying it would further strengthen it. British High Commissioner Sir Rob Young today praised Indian Cricket team’s victory over England in the final of the NetWest triangular series at Lords last Sunday. New Zealand has turned down an invitation to play in a triangular one-day tournament with Pakistan and Australia in Nairobi starting next month, a Pakistan Cricket Board official said today. A case of negligence under section 304 IPC has been registered against the authorities of the Sports Authority of India’s (SAI) STC training centre at the civil lines police station in connection with the death of hockey player Mehtab Singh (18). Australian swimmers are ranked to win 25 of the 38 gold medals at the Commonwealth Games at Manchester from July 25. American veteran Jeff Maggert made the most of the ideal conditions when he raced atop the leaderboard at the Open championship here today. Spain's Sergio Garcia watches as his tee shot hits the rough during the first round of the 131st British Open Championship at Muirfield, Scotland, on Thursday. The tournament begins today and will run until July 21. Criticism of the doping regime in Manchester was premature, organisers said, vowing that athletes would be subjected to stringent testing at next week’s Commonwealth Games. The third day of the $ 400,000 ATP tournament in Umag saw all three seeds — Spain’s Albert Montanes, Chile’s Marcelo Rios and Czech Jan Vacek — dropping out from the first round yesterday. Meerut-based Digvijay Singh shot a course record equalling six-under 66 to emerge sole leader at the end of the opening round of the Rs 15-lakh Royal Springs Open golf here today. Indian football star Baichung Bhutia, the only Indian to join the British League, has kept his options open to play in overseas clubs once again. Talking to reporters here yesterday, Bhutia said, “I have never planned anything in my life and enjoyed the game throughout my career. Newly recruited English coach for the senior national soccer side Stephen Philips Constantine has said India is looking forward to play “positive football” in the Pusan Asiad during September. Haryana snatched victory from the jaws of defeat overpowering Punjab 3-2 to retain the men’s team title in the National Federation Cup Judo Championship here today. It turned out to be a poor day for Punjab as their women’s team failed to defend their title and finished fourth. The team championship at the second district Judo championship was won by SD College while Army School stood second. In girls (32 kg), Pooja was first, Priyanka was second. In 36 kg, Preeti was first and Ruchi was second. In 40 kg, Sapna was first and Swati was second. In 48 kg, Neha was first and Vandana was second. The three-day tour match between India and West Indies A ended in a draw today. Scores: India 253-7 declared (D.Mongia 87, V. Laxman 85) and 255 all out (M.Kaif 77, W.Jaffer 52; J. Lawson 6-76). West Indies A 266 all out (D.Smith 69, R.Hinds 62, D.Bravo 55; A. Agarkar 4-55, H.Singh 4-79) and 81-4. Kaif, India’s hero in the NatWest Trophy final last week, played a matured innings as Indians in their second innings were all out for 255 by tea, a lead of 242 runs after they had conceded a 13-run lead in the first innings. Kaif was the last man out when he hoisted Jermaine Lawson to long on after hitting eight fours and a six in his 127-ball knock that lasted 158 minutes. For West Indies ‘A’ Lawson was the most successful bowler claiming six wickets for 76 runs while Reong King bagged a couple. To clinch an upset victory the West Indies ‘A’ require to make 243 from 40 overs in the final session. India had declared at 253 for seven in their first innings yesterday and the Caribbeans replied scoring 266. Earlier, resuming at their overnight 87 for three in their second knock Indians had slumped to 163 for six at lunch today. Kaif not out on 24 at lunch, perked up the innings which was in shambles at 149 for six, put on 85 runs for the seventh wicket with Dinesh Mongia (27) to sail Indians to a safe score. But he lacked support as Mongia (27) wasted a good base. Ajit Agarkar departed next leg before off the first ball he faced and Harbhajan Singh (5) snicked one to the ‘keeper to hasten the end of the Indian innings. India (Ist innings): 253-7 decl. FoW: 1-0, 2-63, 3-86, 4-115, 5-130, 6-149, 7-234, 8-234, 9-253. The 13-member team which was to be announced today would now be named on Saturday, a spokesman for the English and Wales Cricket Board told PTI here today. “The announcement of the team has been deferred till Saturday due to the injuries to Trescothick and Caddick. The team will now be announced on Saturday,” the spokesman said. Speaking to reporters soon after his arrival here late last night, the dashing middle order batsman from Punjab said, “I was looking forward to the Test series as I wanted to make a mark on the longer version of the game as well, but when I chipped a bone in the little finger during the final, I was really disappointed”. Yuvraj Singh, originally picked up for the triangular series only, came close to selection for the Test series following his stupendous performance with the bat. But he was forced to return home after sustaining the injury. However, he said “I guess I will have to take it in my stride as injuries are part and parcel of a sportsman’s career”. “Our main task was to rebuild the innings”. “We ran our singles and twos pretty hard and once we had put on 50 runs, we could accelerate quite comfortably”, Yuvraj Singh said. “Of course I felt very bad not to have played till the end but at the same time I had to go for my shots as the run-rate required was seven plus”, he said. When asked about the reaction in the dressing room, he said “Skipper Saurav Ganguly, was very happy. In fact it felt very good”, he said. Asked if the team needed any changes, the former middle-order batsman told PTI here: “It depends on Srinath. He says he will play only for one-dayers. I can’t say anything since it’s up to the team management and selectors. But if he (Srinath) gets into the team, it’s a plus point”. Srinath had announced retirement recently from Test cricket but said he would be available for the one-dayers and focus on the World Cup. He had been ignored by the selectors for the NatWest Trophy. The win, Viswanath said, had given the team new found confidence in the lower order batsmen. Now, the top order batsmen know that the side can bat for 50 overs. Instead of going for shots, they can now plan accordingly. The win at Lord’s notwithstanding, Viswanath said the team needed improvement in all departments of the game. He also congratulated cricket lovers in India for their team’s stunning performance in the final. The High Commissioner was speaking at a function in which he presented two free business class return tickets and accommodation in London to Rahul Soni winner of the web quiz, to witness the England Vs India Test match at Lords from July 25 to 29. The commission here had organised a ‘India-Soul of Cricket Competition’ quiz competition on their website during the England team’s India tour from November 2001 to February 2002. A high-ranking Sri Lankan cricket official says match-fixing is an ongoing problem despite a crackdown by the sport’s international governing body. Schaffter refused to elaborate on who was involved, where or when match fixing was occurring or whether he was talking about domestic or international matches. “It won’t be right for me to talk about other teams,” he said. Schaffter, a member of Sri Lanka’s ethnic Tamil minority, was also manager of Sri Lankan national teams touring India in 1982 and for the 1999 World Cup in England before be was fired for alleged links with the Tamil Tiger rebels fighting for a separate state on the island. He was reinstated as manager for the England tour by Sri Lanka’s new government, which has signed a cease-fire agreement with the rebels. But he’s been removed again, and says Sri Lanka’s cricket administration has treated him “shabbily”. “Some people want me out because I follow the rules... they may have been match-fixers,” said Schaffter, refusing to substantiate his charge. New Zealand has turned down an invitation to play in a triangular one-day tournament with Pakistan and Australia in Nairobi starting next month, a Pakistan Cricket Board (PCB) official said today. Mujahid said New Zealand had informed him that their team could not play in Kenya because of an already heavy international schedule. The New Zealand team recently finished a tour of the West Indies after playing in Sharjah and Pakistan. New Zealand were originally scheduled to tour Pakistan for a three-Test series last September, but the tour was put off after the September 11 attacks on the USA. Mehtab Singh died in his room at the STC hostel, adjacent to the NIS, after he accidentally touched a cooler at about 9 pm last night. The post mortem report is still awaited. The body of Mehtab Singh, who belonged to Ropar district, was kept at the STC hostel till 11.30pm last night. The top brass of the NIS, including Executive Director (Academics) Col B.S Ahluwalia, Mr P.C Kashyap, Regional Director, Northern centre, Chandigarh, and Mehtab’s parents immediately rushed to the spot after being informed of the incident. Mehtab had just returned to his room after undergoing a practice session held in the evening in preparation of a match slated to have been played today between the STC Northern Centre and the STC Western Centre. It is being claimed that Mehtab tried to tinker with the cooler since it was not working properly which eventually proved to be disastrous for the young hockey player. So strong was the current that Mehtab died on the spot before any medical aid could be rushed to him. Sources reveal that Mehtab was a talented player that his selection in the `Centre of Excellence’ scheme launched by SAI was a foregone conclusion. Wonder swimmer Ian Thorpe spearheads the world’s number one swimming nation which is expected to overpower their rivals in the pool at the Games. Australian swimming is in another of its golden eras after its Thorpe-inspired success at last year’s World Championships. Australia topped the medals count in Fukuoka, Japan, with 13 golds, up six on their gold medal return in Perth three years before. The USA came away from Japan with nine gold. Australian high performance director Greg Hodge is looking beyond the Manchester Games and to the 2004 Athens Olympics for a true assessment of his team’s standing in world swimming. Traditional pool rivals, England and Canada, were streeted by Australia at the worlds. Britain claimed seven medals, one of them gold, while the Canadians got none. Hodge is anticipating his young women’s team will go some way towards closing the gap on the powerful men’s contingent led by world record holders Thorpe, Grant Hackett and Geoff Huegill. Almost half of the women’s team members for Manchester are aged 18 or under, representing a significant investment in the future. “There’s no doubt about it, we’ve got the strongest men’s team,” Hodge said. “I think the real test for us will be how our women stand up. The Commonwealth Games have produced some of Australia’s finest moments in swimming. Susie O’Neill claimed six gold medals at the 1998 Kuala Lumpur Games to finish her career with 10 in three Commonwealth campaigns - the most of any athlete in any sport. Kieren Perkins scored an emphatic 1500m freestyle gold medal success in Victoria, Canada, in 1994, when he set world 800 and 1500m records in the same race. Hodge said world records would be difficult to achieve in Manchester. He said conditions at the Manchester pool would disadvantage the athletes. “The pool is not designed as a major international competition pool in terms of its space and environment,” he said. Australia has dominated the Commonwealth swimming competition at the last three Games in Auckland, Victoria and Kuala Lumpur. The last time they had any stiff competition for Commonwealth swimming supremacy was in 1986 in Edinburgh, when Australia and Canada tied 11-all in the gold medal count. Without a world record and little rivalry for Australia in many events this time around, it will be duels between rival team mates which is expected to lift the meet. Thorpe and Hackett will continue their battles in the 200 and 400m freestyle. The 38-year-old, who finished third in the US Open last month, reached the turn in three-under 33. 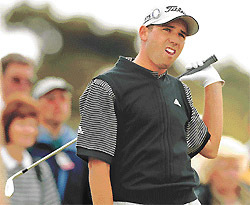 As Maggert began the road home, world number one and firm favourite Tiger Woods was at level par after three holes. Woods risked dropping a shot at the first when his drive landed in the waist high rough lining the fairways but he managed to hack out and get up and down from 60 yards to save par. But if Woods was playing par golf early on his playing partner, 21-year-old Justin Rose, was quickly moving up the leaderboard, starting the day par, birdie, birdie, to be only a shot behind Maggert. Without a hint of a wind, Muirfield was at the mercy of the world’s greatest golfers and nearly all the early starters were quickly getting into red figures. Two-time US Open champion Ernie Els was one-under after five holes and but for two missed short putts could have been three-under. But a double bogey on the par four sixth and suddenly Els was over par. Brad Faxon, playing with the South African, was two-under after five. But for Open champion Tom Watson, who won here 22 years ago, it was a battle of survival. The 52-year-old began with a double bogey and although he got slight relief thanks to a birdie at the second he was quickly ensuring himself a early trip back home. By the time he walked off the 10th green he was six-over par. Weathermen predicted the windless conditions would last throughout the day, leaving the course unprotected and promising a feast of low scoring. More than 3,500 athletes from 72 countries will compete at the games, starting on July 25. The Commonwealth Games Federation outsourced drug testing here to UK Sport, which conducts year-round drugs testing of British athletes. The World Anti-Doping Agency (WADA) will conduct out-of-competition testing for EPO, starting this week, and will send a team to monitor testing procedures during the games. Verroken said blood testing procedures were outlined in the doping information given to games athletes. Yesterday, Australian swimmer Ian Thorpe, who is in contention for seven gold medals at the Games, had criticised the lack of EPO testing during the event. “We remain open to the possibility of testing for EPO,” Verroken said. 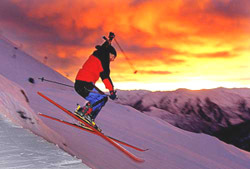 Erythropoieten, known as EPO, is a substance that boosts endurance by stimulating the production of oxygen-carrying red blood cells in the body. Verroken said UK Sport had begun out-of-competition tests on athletes who were eligible to compete at the games in January, but only in Britain. She said integrating the non-Olympic sports into the Commonwealth Games testing procedures was a challenge. “It’s more difficult because we are trying to bring them together under one set of rules. For example, if there is a penalty, will that apply after the games,” she asked. Pre-games tests have already caught English pole vaulter Janine Whitlock, who tested positive for an anabolic steroid last month. She faces a disciplinary hearing on July 23 and is likely to be suspended for the games. Nigeria’s weightlifting team won’t compete either because of doping ban imposed in 2001 after four members of the squad failed drug tests. At the 1998 Commonwealth Games in Kuala Lumpur, Malaysia, the highest-profile positive test was from pole vault silver medalist Denis Petouchinski. The Russian-born athlete competing for New Zealand tested positive to the banned anabolic steroid Stanozolol and was stripped of his medal. Cyclist Stephen Alfred of Trinidad and Tobago and shooting competitor Rustam Khan of Pakistan also tested positive in KL. Neither won a medal. At the 1994 games in Victoria, Canada, Horace Dove-Edwin from Sierra Leone was stripped of his silver medal in the 100 metres for testing positive for anabolic steroids. Canadian weightlifter Jim Dan Corbett was also stripped of his three bronze medals after testing positive for stimulants. WADA will not test athletes before the Commonwealth Games in the non-Olympic sports of squash, rugby sevens, netball and lawn bowls because it does not have agreements with those international federations. Koehler said WADA was in discussions with 30 recognised non-Olympic federations to arrange testing for future multi-sport events. Third seeded Chilean Rios, 29-ranked, was defeated by rank outsider Romania’s Victor Hanescu 6-0 6-4. The 210-ranked Hanescu, a rare sight at ATP events, took the first set in only 16 minutes. Rios, who won here in 2000, was brushed aside in humiliating fashion. He played badly with the percentage of his first serve at only 56 percent, and making six double faults. After Hanescu made a break, leading 3-0 in the second set, Rios started showing signs of nervousness throwing his racket all over the place. Rios, the fans’ favourite star at the start, began to complain about the old balls only when he saw that his ball was out. With the crowd starting to cheer for Hanescu he made another break and won the match. Rios’s bad performance could be put down to the fact that since April and his injury he has only appeared in last week’s Davis Cup tie against Germany. Another Chilean, Nicolas Massu, made it to the second round by defeating eighth seeded Vacek 6-0, 6-2. Massu, ranked 61, won in 62 minutes. Vacek did not prove to be much of an opponent with only 40 percent of his first serve in. The bright sunny day saw as many as 16 sub-par scores. The icing on the cake were two-holes-in one second by Gaurav Diwan on the second hole with a nine-iron tee shot and by Shamim Khan with a six-iron on the fifth hole. Veteran Ali Sher and youngster Hamim Khan were tied for the second place at five-under 67, while a bunch of players including Hero Honda Masters champion Harmeet Kahlon and Indian Open Winner Vijay Kumar were tied at four under 68. Jyoti Randhawa, making a comeback after a five month injury layoff, was going great guns before making an unfortunate triple bogey on his 15th hole (the sixth of the course after starting from the 10th tee). He finished the day at three-under 69. Country’s top player and winner here last year, Mukesh Kumar had a nightmarish start with a five-over 77, while Sher-e-Kashmir Open runners up Gaurav Ghei shot a forgettable three-over 75. Digvijay matched the course record effort of Vijay Kumar in the final round of the Sher-e-Kashmir open in October last year. Digvijay missed birdie putts from 10 feet on his first two holes before draining a six-footer on the third. His other birdies came on the sixth, seventh, ninth, 10th and 15th holes. Main scorers (after 18 holes): 66-Digvijay Singh, 67-Ali Sher, Shamim Khan, 68-Vijay Kumar, Rahil Gangjee, Pappan, Feroz Ali, Harmeet Kahlon, 69-Jyoti Randhawa, Minky Barbora, SSP Howrasia, 70-Ashok Kumar, Binod Pandey, Ranjit Singh, 71-Vivek Bhandari, Dyal Singh. The soccer star returned from England after the completion of his injury-marred three-year stint with F C Bury, a second division club in British League. “The best thing is to go and play positive football. We have a good crop of players and the boys are working extremely hard,” he said in his maiden press conference since the beginning of the conditioning camp for the Asian Games at the J R D Tata Sports Complex here on July 7. “These are what constitute a good team. Precision in the use of space and the need to keep moving all the time are also important,” Constantine said. A 20-member Indian squad would be announced by the end of this week, he said and added that the national team would take part in the six-nation LG Cup at Vietnam from July 30. The camp will continue till July 27. India will play their first match against Singapore on August 2. The other teams in the tournament are Vietnam(senior and junior), Thailand and Indonesia, he informed. Constantine stressed for grooming Indian footballers from a tender age and opined that the soccer academies should nurture the budding footballers from grass-roots level. “In Europe and other major football playing countries the training begins from the age of seven or eight but here it starts from the age of 14 or 15 which is a bit late” he felt. India would host the Afro-Asian Games from October 24 to November 1 next year. The approval to hold the games, which were to be held in November last year but cancelled in the wake of September 11 terrorist attacks in the USA, was given by the Union Cabinet today, Information and Broadcasting Minister Sushma Swaraj told reporters here. Haryana snatched victory from the jaws of defeat overpowering Punjab 3-2 to retain the men’s team title in the National Federation Cup Judo Championship here today. It turned out to be a poor day for Punjab as their women’s team failed to defend their title and finished fourth. The Women’s team title was won by, last year’s bronze medallist, Central Industrial Security Force (CISF). CISF judokas overcame stiff challenge from Haryana before emerging 3-2 winner. At one stage it looked as if Haryana women will emulate their men’s team performance but CISF judokas fought back gallantly to claim the gold. The team championship at the second district Judo championship was won by SD College while Army School stood second. 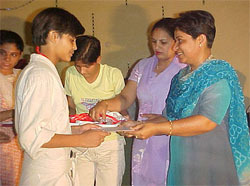 In girls (32 kg), Pooja was first, Priyanka was second. In 36 kg, Preeti was first and Ruchi was second. In 40 kg, Sapna was first and Swati was second. In 48 kg, Neha was first and Vandana was second. In 50 kg, Gayatri was first and Savita was second. In 55 kg, Neha Chauhan was first and Khushbu was second. In the open category, Rajwant was first and Neha was second. In boys 30 kg, Vinod was first while Govind was second. In 35 kg, Surinder was first while Rishikesh was second. In 40 kg, Darshan Singh was first and Rohit Kumar was second. In 45 kg, Munish was first and Ashish Joshi was second. In 55 kg, Ravinder was first and Harish was second. In 65 kg, Jatinder was first and Raman was second. In open, Sandeep was first and Gurmeet was second.